We have a really small car! 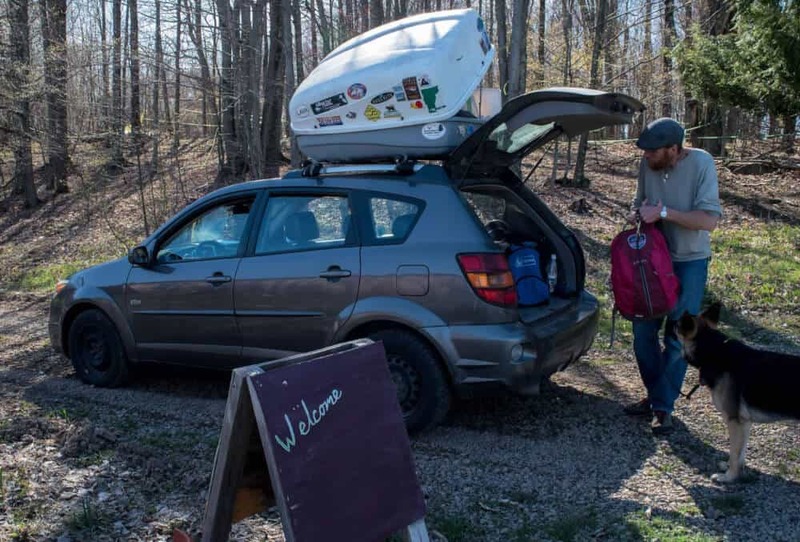 As passionate road-trippers, we’ve been known to live out of our little Pontiac Vibe for weeks, even months on end. In my opinion, it’s one of the best road trip cars out there! We choose to travel in a tiny car for many reasons -maneuverability, great gas mileage, and easy upkeep, just to name a few. And we’ve become experts at packing light. Our experiences backpacking have really helped us learn to pack only the bare necessities for long road trips in a small car. When you’ve lived your life out of a backpack, a car trunk seems cavernous. Of course, that makes it tempting to pack more than you need, but in the end, tough decisions are made, and the car wins. So what do you have to pack for a long road trip in a small car? Well, that depends on where you’re going and what you’re doing, but I do have a few tips to share based on our own experiences packing a small car for a big trip. n Loading up our small car for a camping trip. Obviously, when you’re packing a small car for a long road trip, you don’t want to fill it with stuff you won’t use. Start by thinking about the season you’ll be traveling in, as well as how long you’ll be gone, and what you plan to do on your trip. Road tripping with kids and/or dogs will take extra considerations, of course. Our family is big on outdoor adventures, and we mainly travel in the summer, so our packing list usually reflects that. Next, create a packing list, starting with supplies that your family can’t live without (clothes, food, and shelter), and moving on to items that may make your road trip more exciting and memorable (fishing poles, toys, games, books, and musical instruments). Recruit your kids to make lists of their own. Even if you have to nix the idea of bringing along the pet iguana or the boogie board, at least their ideas were in the running. If you truly think you will have more stuff then will fit into your car, consider buying, renting, or borrowing a car-top cargo carrier for extra gear. Even though ours isn’t the most beautiful, I don’t think we could road trip in our small car without it. We use the cargo carrier to hold all of our bedding, backpacks, tents, and souvenirs, while our trunk stores the food, cooking supplies and clothing. 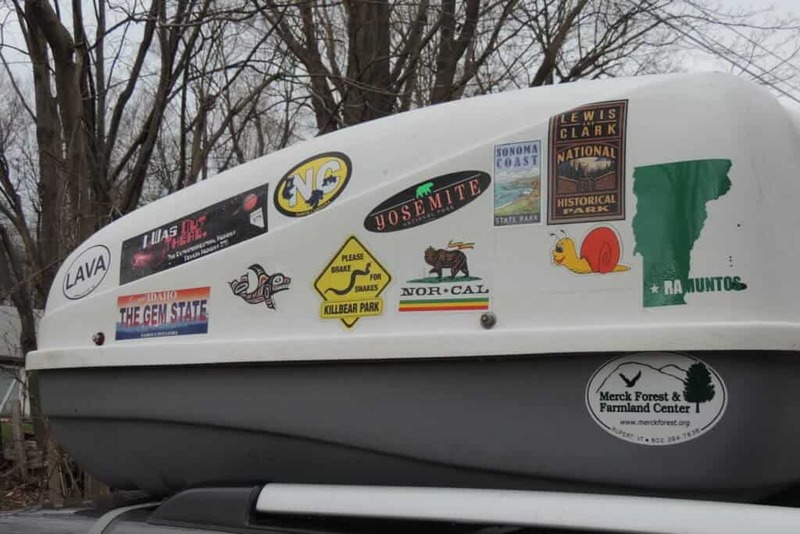 We collect stickers from places we’ve been and put them on our cargo box. This packing list is for a months-long, cross-country road trip in a small car. It’s the road trip packing list that we used for a family of four on a summer trip. To save money, and because we love being outdoors, we planned to cook almost every meal outside and camp every night of the trip. Your packing list will be much different if you are driving from hotel to hotel and eating in restaurants. Clothes – For each person, we pack underwear and socks for one week, a few pairs of shorts and t-shirts, bathing suit, one pair of pants, long underwear top and bottom, fleece pants, fleece pullover, windbreaker/raincoat, wool cap, gloves, hiking boots, sandals, and one dress (for me). Everyone’s clothing stash goes into a compression sack. We bring another compression sack for communal dirty laundry. The bags of clothes live in the trunk for easy access. , travel mugs, silverware, backpacking cookware, cooking utensils, two collapsible buckets for dish-washing, biodegradable dish soap, microfiber dishcloths, a tablecloth, matches, and propane. You can read more about our camp kitchen in this post. The Fridge – Our little cooler usually contains our dairy products and vegetables, plus the snacks for the day, which we prep in the morning. We rarely use ice, so we have to eat things up pretty quickly. The cooler sits between the kids in the back seat so they can access snacks while we’re on the road. The Pantry – The pantry is a big Rubbermaid tub. In it, we keep canned goods, crackers, bread, our spice kit, coffee, refillable water bottles, and condiments. The pantry gets refilled about once a week, just like at home. Car repair kit – Our emergency car repair kit contains motor oil, anti-freeze, washer fluid, a small air compressor for filling the tires with air, miscellaneous tools that I really didn’t pay attention to, because honestly, if it were up to me, I would just call AAA and hope for the best. First Aid Kit – Because we like to travel off the beaten path, we always keep a well-stocked first aid kit on hand. You can read more about our first aid kit here. Fun stuff – If there’s room, we pack toys and instruments, including a travel guitar, harmonica, various books and field guides, binoculars, an iPad with a keyboard for blogging, smartphones, a camera, colored pencils and journals, a backpacking hammock, Frisbee, football, swim goggles, card games, and dice. Dog stuff – We did not have room for our dog on this particular road trip, but he does travel with us fairly often. Here’s our gear list for traveling with dogs. Occasionally we get bored with our clothes or books and we have stop at a used book or clothing store to trade them out. We don’t usually buy souvenirs, but we do collect stickers for our cargo box. Now every time I look at our cargo carrier, I want to hit the road again. 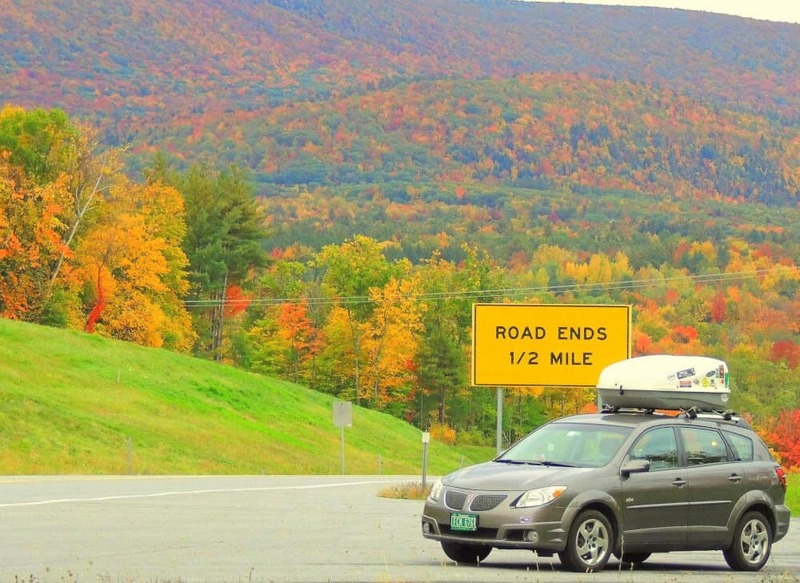 What are your must-have necessities for long road trips? 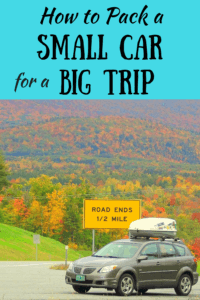 Have you ever traveled across the country in a really small car. It’s an adventure, that’s for sure. I’m grateful I haven’t had to do this in a while, but I can appreciate where organization is a big factor in packing a small car. This is nice. Thanks for sharing these tips. I am planning to do a road trip with girlfriend next month so I am looking for ideas and tips of what I may need. Great tips! I own a small hatchback car, it does work perfectly somehow but it would be nice if we are prepared. Anyways, great post! Excellent tips! I’m going to do a road trip in the coming months, it’s going to be on an RV though but good suggestions nonetheless :). Great tips! I think you might be a Lego expert of some sorts. I usually end up overloading my van with unnecessary things that I convince myself that i’ll use. Maybe one of this days I’ll learn. Thanks for the comment, Darryl. I’m not a lego expert – I’ve just had a lot of practice. Tara, thank you for such a rear info because a lot of car-travelers prefer to have an MPV or a Jeep for the long trips. I want to add that better to have your emergency car repair kit somewhere at the top of your trunk, to have an opportunity to take out a compressor or a spare tire without taking out all packed items! I’m so glad I found your site! We have a Pontiac Vibe too!! We’re doing a road trip across the US next July/Aug/Sept and in the months to come we are testing it out on shorter trips. Thanks for the tips! That’s awesome, Deah! It’s a great road trip vehicle. We’ve put a lot of miles on our little car since we bought it, and it’s such a trooper. Have fun on your road trip. I’ll be out wandering around next summer as well. My RV is loaded down with way more stuff than what’s on your list. Some day I will have to “downsize” and give this a try. It’s amazing how many people don’t take a first aid kit! You just never know what could go wrong so it helps to be prepared. I always make sure to take some sort of water filtration device as well if I’m going camping, just one of those “life straws”. That’s a good idea, Steve. I’m adding that to our packing list – you just never know. I don’t do a lot of road trips but this is a great list for when I start to! I’ll have to keep these tips in mind as I tend to overpack for these types of things. Really helpful article! Great list! You’ve done a great job packing so many essentials into a little car – the cooking equipment surprised me the most! We do have a car repair kit for road trips, but I have to admit that that’s my partners domain. I’m useless! Wow, you are great road trippers! We never had a kitchen in our car. Well, because there are just two of us and we just eat at truck stops. We simply carry snacks and drinks in a cooler. And camp for the night at cheap motels. Whatever works, right? It’s not a “real” kitchen, though. Just a way for us to keep ourselves from eating junk food. I love road trips as well, and we’ve packed over and over again. I love that when you have multiple stops, you keep packing it the same way. Great tips. Melody, if I were truly traveling alone (without my husband), I would bring jumper cables, oil, washer fluid, and a small air compressor. Oh, and my AAA card. My family and I have to use these tips on our next road trip now as we are planning to bring a small car with us! Great advice! I am currently planning a road trip with my mini cooper, not too much space 😉 but I love it for a road trip somehow. I figured if I can do a two week holiday with a carry on, this should also work. That’s awesome, Wendy! I also love the feel of a small car. Love the Mini Cooper, too! Though we do not do too many long car trips. I can very well appreciate the benefits of a small car. As you mention, manoeuvrability, economy and also parking are great advantages. I really appreciate how you optimise space and make the most out of your car. When you have limited space it really makes you think about what you need and what are really luxuries. It seems backwards, but by having less you actually have more freedom and you have some great tips. I love the kitchen. Hard to get more minimalist than that. Totally agree, Kevan! Sometimes we think about buying an RV or other travel trailer, but I think it would set huge limits on where we could go. Hi Tara, I am putting a first aid kit together for my granddaughter’s girl scout troop. I would like to add a few things to your list, if I may. In mine I added moleskin, since it’s very inexpensive and you can cut the sizes you need. allergy chewables for children and non drowsy formula for older children/adults, water filtration bottle, arm sling or large bandana to make one, smelling salts, neosporin, and hospital emergency contact numbers. I was quite excited to see that you travel with a Pontiac Vibe! I love mine for trips. I keep about half this list packed perpetually (car repair, first aid, roadside emergency). We LOVE our Vibe. When were looking for a car that could handle long-distance travel. We first looked for great gas mileage, and then we looked for trunk space. We also needed to fit really tall boys in the back seat. The Vibe exceeded our expectations and it’s still going strong with 200,000 miles. On our very first road trip, I was amazed at how many clothes we brought. We ended up sending most of it home. Now it’s the food that takes up the most space. Thanks for commenting, Craig. I enjoyed reading your blog.